If your website takes more than 4 secs to load on a browser then it is a slow loading website. Google is now considering website load time as a factor to rank a website in search results. -> Do you know that if a website takes more than 3-4 seconds to load then the visitors are likely to leave that website? -> You know very well that there are millions of website on internet that are selling the things or services similar to you. -> So visitors have a choice to leave your website and save their time rather than waiting for your website to load. But, you can easily speed up your website and maintain its performance. Take my e-book and get rid of a slow loading website. There are few tips and tricks in WordPress if your follow that then you can easily improve your website performance to upto 60%. 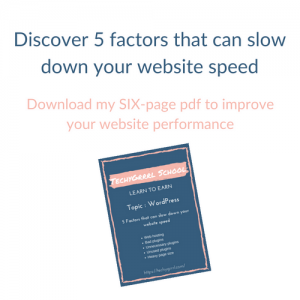 I have listed 5 factors in my e-book that will help you keep your website load fast. Download it now by simply entering your details below or click on the messenger button to receive it directly in your FB messenger.